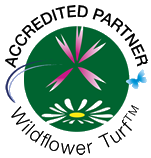 Paradise Found is an accredited installer for Wildflower Turf Ltd, the premier wildflower turf supplier. Wildflower turf naturally produces a bio-diverse habitat supporting and encouraging native mammals, birds, bees, butterflies and other invertebrate species. Wild Flower Turf uses a seed mix of 50 percent wildflower seed and 50 percent grass seed in its soil-less system. This high wildflower content prevents the grasses from dominating the sward. The formation of a dense sward of mature wildflowers and grasses allows the wildflower turf to act as a weed blanket suppressing the establishment of weeds from the prepared soil.